Forward Stride’s mission is to enhance quality of life through horse-centered activities and therapies. This means that every program, clinical or not, has the power to have lasting therapeutic benefit to its participants. 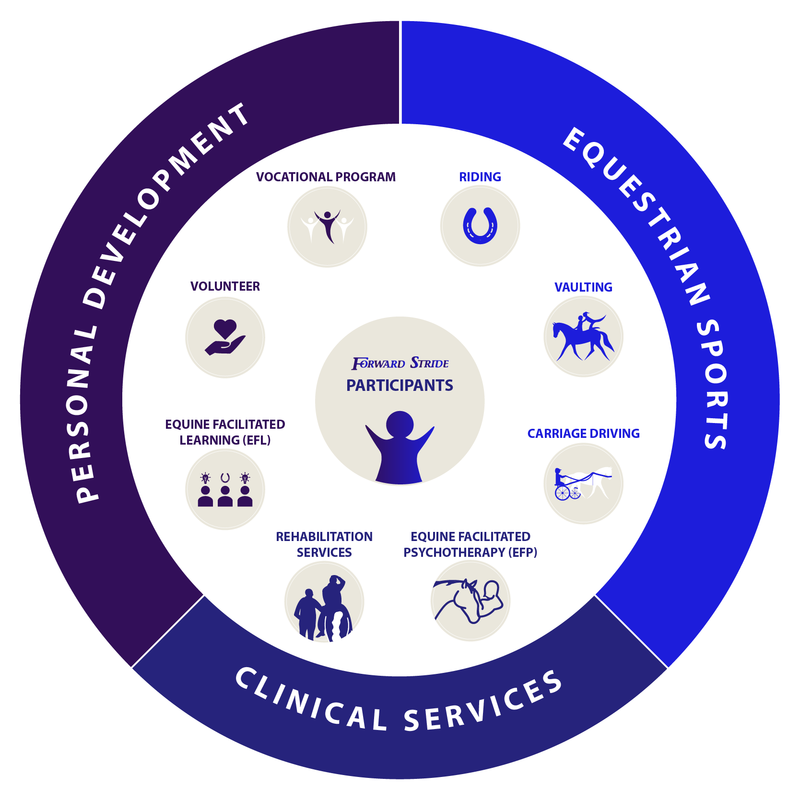 Our seven programs are organized into three categories of services: Equestrian Sports, Clinical Services, and Personal Development. Click on the program names to learn more, or click the button below your preferred program to register. Our Riding Program offers children and adults of all abilities—including those with special needs—opportunities to develop horsemanship skills, fitness, and self-confidence. This adaptive program includes classes in basic riding, dressage, drill team, western patterns, and jumping. Forward Stride currently offers Competitive Vaulting and an Interactive Vaulting Program is in development. Vaulting is proven to promote strength, balance, flexibility, team bonding, and self-confidence. Equine movement is a powerful treatment tool that can be utilized by a licensed and specially trained physical therapist, occupational therapist, or speech and language pathologist. At Forward Stride we offer children and adult sessions with licensed therapists (e.g. physical, occupational, speech and language) who specialize in using equine movement as a treatment tool in integrated treatment plans. Equine Facilitated Psychotherapy (EFP) is an experiential therapy administered by a licensed mental health professional and a certified equine specialist to address specific psychotherapy treatment goals. Horses willingly participate in these individual or group sessions giving the client a holistic treatment experience. At Forward Stride, we offer individual and group therapy sessions for personal growth and treatment for those with mental disorders and/or looking to improve relationships with self and others. Volunteering plays a huge role in building self-esteem, confidence, and overall well-being. Our volunteers are a crucial component of our Continuum of Care. An experiential learning approach that promotes the development of life skills for educational, professional, and personal goals through equine assisted activities. Providing vocational training for high school students and adults with the goal of demonstrating the skills to obtain meaningful and regular employment in the community.